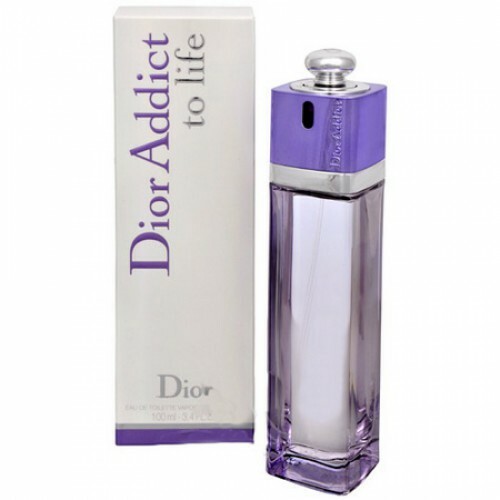 Christian Dior Addict to Life is a new modern version of Dior Addict. Christian Dior Addict to Life 100ml. Eau De Toilette is a new modern version of Dior Addict - rebellious flavor bold independent women, launched a French brand Christian Dior in June 2011. It is an elegant oriental-floral composition with fruit and wood shades, the famous perfumer Francois Demachy originator of many modern perfumes for Dior House. Innocently sweet fruit entry Addict to life composed of juicy notes of raspberry, peach and pomegranate tart freshness subtle shades floral bouquet "heart." Shining and sparkling roses chord, combined with jasmine and lily of the valley elegantly soloist in the new composition of the House of Life Addict Christian Dior, towering over clean and soft musky-woody (cedar note) base of the pyramid. All in love with life Dior House dedicates its new creation Addict to Life - flavor, which feels romantic mood of spring and the heady smell of blooming lilacs. Its owner confident and knows what she wants. She lives life to the fullest and feels free and easy. Putting elegant shoes with high heels, she moves to the beat of the city, and her heart feels the pulse and the hectic pace of life of a large metropolis. It is easy and swift, and nothing can get her to withdraw from their own desires. Life - and her greatest passion! Composition: rose, lilac, jasmine, white musk. Fragrance created in 2011. The highlight of perfume Addict To Life then its floral heart, which blossoms playful mix of sensual jasmine, lily of the valley and the gentle romantic roses. Indescribable, radiant fragrance eau de toilette Christian Dior Addict To Life allows you to always be yourself and still exceptional in every situation. With this perfume you will feel great throughout the year and will spread around positive aura. Toilet water Addict To Life You will love you and your surroundings.